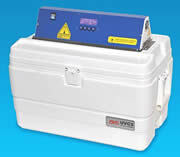 The EMS UVC3 Cryo Chamber has been specifically designed to provide an economical yet precisely controlled low temperature environment for polymerization of polymers and resins for cryo specimen preparation. 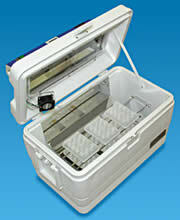 It can also be used for dehydration and infiltration of cryo specimens. This simple and functional unit has a large insulated chamber and comprises fully automatic temperature control for the polymerization process of embedding resins and polymers. This cryo pin has a diameter of 2 mm and is compatible with the Leica and RMC cryo ultramicrotomes. Aluminum specimen mount pin for mounting samples for ultramicrotomy. Available in two types: Slotted Screw and Bullseye. Sticks to where you want it. Will not run – No waste. 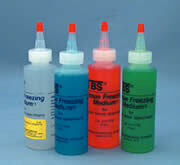 It is a highly viscous, water-soluble embedding medium for frozen sections that "stays put". The gel is packaged in a pump-dispenser bottle that can instantly dispense the gel in any position. The dispenser has a built-in "guillotine" that cleanly severs the gel from the pump spouts and prevents any "stringy" medium from pulling away when the bottle is removed. To use, simply dispense gel on a room temperature block-holder. Use a cold heat extractor to form a base layer. Dispense additional gel. Place the tissue on top of the gel. Use a cold heat extractor to freeze tissue and form a block. Sakura Finetek - This is a well known water soluble glycols and resins compound that provides an excellent specimen matrix for cryostat sectioning at temperatures of -10°C and below. It leaves no residue during the staining procedure. A high purity 1, 1, 1, 2 - Tetrafluoroethane (R134a) that you can rely on to solidify paraffin sections of fresh tissue without disrupting cellular structure. A short spray burst will instantly freeze small area to -45°C/-5°F. Environmentally Safe and non-flammable. For the Flash freezing of tissue specimens in the Cryostat as well as being used to harden difficult to cut tissue on a microtome during the sectioning. 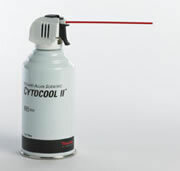 CytoCool II is an aerosol that does not contain any ozone depleting (CFC'S). Controlling the tissue freezing is simply done by varying the finger pressure on the trigger nozzle. This unique feature helps to prevent over cooling of the specimen. Ozone-safe, but just as effective. Frostbite Rapid Coolant contains no CFCs yet maintains the ability to rapidly cool paraffin blocks and tissue. Two quick bursts will ensure deep penetration into both paraffin blocks and fresh tissue specimens. Mr. Frosty Cryo 1°C Freezing Containers are inexpensive, reusable and convenient devices for freezing biological samples. Freeze cells in tubes from 1 to 5 ml using the Mr. Frosty™ Freezing Container. The simple-to-use system is designed to achieve a rate of cooling very close to -1°C/minute, the optimal rate for cell preservation. Isopropyl alcohol is necessary to achieve the recommended rate of cooling. We now offer cryogenic personal protective garments of the highest quality. 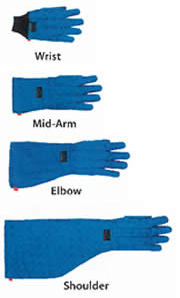 Cryo-Gloves® and Cryo-Aprons® are essential accessories for those working in ultra cold environments. 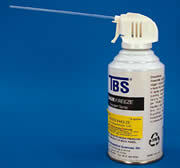 Providing effective protection in a wide variety of applications. Cryo-Gloves® and Cryo-Aprons® are registered trademarks of Tempshield, Mt Desert ME. These aprons are 100% water-proof with adjustable straps, for neck and waist. The vented safety goggles help avoid chemical contact. Electron Microscopy Sciences is proud to introduce a cryo starter kit which includes all of the supplies necessary to begin Cryo EM. 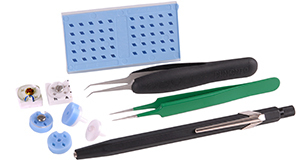 The kit includes a variety of our Cryogenic Grid Storage Boxes, Manipulation Tweezers and Gripper Tools, as well as our C-Flat Holey Carbon Cryo Grids. The Tweezers we are using are coated as well as anti-magnetic.